The past two weeks have witnessed a bewildering amount of activity in the United States with regards to the admission, and exclusion, of migrants and refugees from seven majority-Muslim nations. On January 25 and 27, President Donald Trump issued two Executive Orders that immediately barred Syrian refugees from US resettlement, barred permanent and temporary migrants from Syria, Iraq, Iran, Sudan, Somalia, Libya and Yemen for 90 days and slashed US refugee resettlement efforts in half, while suspending the U.S. Refugee Admissions Program (USRAP) for 120 days, except for a small number of Christian minorities fleeing religious persecution. The response we have seen has been mixed. Outrage and protests in the United States and around the world, with swift actions by lawyers and state authorities, but also a 49% approval rating for Trump’s actions. At the time of writing, a federal court in Washington had lifted the ban and the U.S. Federal Court of Appeals was hearing arguments from both sides about whether the ban could be legally re-imposed. All expectations are that a Supreme Court challenge is imminent. These are sobering, sobering times to say the least. 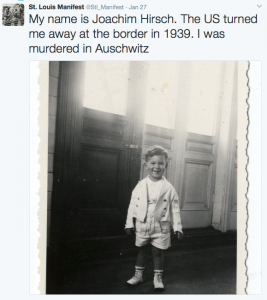 As someone who researches the history of refugees, I have been unmoored by the speed and viciousness with which the Trump Administration has acted against a select group of migrants. I am at the same time buoyed by the strength of popular protests and the efficacy of activists and legal experts in pushing back against actions that are seemingly unconstitutional and definitely unconscionable. Yet as a historian I remain disquieted by the ease with which the Administration has disregarded decades of work designed to shelter people fleeing dangerous circumstances from the very discriminatory policies that it is now advancing. The sad reality is that refugees have historically been scapegoated by governments seeking political gains. Cast as the hostile and dangerous outsider, refugees have been marginalized at every turn: from admissions, to settlement, to inclusion. This ostracizing has taken place on the back of the most vulnerable in international society, individuals who no longer enjoy the protection of their states. Because nation-states occupy the highest rung in the pinnacle of authority, migrants without the backing or sanction of states, appeared threatening to authorities. Combined with various kinds of discrimination (anti-Semitism, xenophobia), the lack of political sanction rendered refugees undesirable, and even dangerous, in the eyes of those who became responsible for determining their fates. I have written previously about the political and historical contingencies that shape the very use, and embrace, of the refugee label so I won’t go into too much detail here. Suffice it to say, the fact that President Trump has targeted migrants and refugees in his first few days in office is no accident. He has deliberately politicized these groups in order to create fear, stew hostility and test the waters of public sentiment to see how keen people are to see further actions of this sort. Although the public protests are heartening, it is disturbing to see public opinion polls that suggest almost fifty percent of Americans endorse these actions. Once upon a time, I would have written that all people had to do was look at the historical record to better understand the origins of our present circumstances and to think about possible strategies beyond the ones presented by the US Administration. That now strikes me as naïve, especially given the Trump Administration’s disregard of any substantive interpretation, analysis or evidence from the past. President Trump issued some of the Executive Orders pertaining to refuges and migrants on International Holocaust Remembrance Day, either in defiance or outright ignorance of the significance of the day and the United States government’s own history in turning away Jewish refugees who sought shelter on American shores. 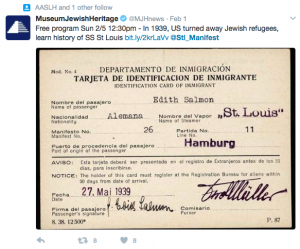 In May of 1939, the St. Louis left Hamburg and sailed to Cuba, in the hopes of securing refuge for its 937 passengers, many of whom were Jews fleeing the Third Reich. Cuban authorities admitted only a few passengers before turning the boat away. It was turned away again by officials in the United States whose anti-Semitic views overpowered any sense of obligation to provide assistance to those in need. After also being refused admission by the Canadian government, the boat returned to Europe. Great Britain, France, the Netherlands and Belgium provided refuge. However, 254 St. Louis passengers ultimately perished in the Holocaust when German forces invaded countries where the ship’s passengers had sought refuge. The story of the St. Louis and the efforts by Neiss and Schwartz to make sure that its history and its significance are never forgotten speaks to what is at stake in the current moment and how people with a sense of the past, and the possibility of learning from past tragedies, can make different, or at least informed, decisions when faced with similar circumstances in the present. Yet the Tweets did not tell the whole story. Missing from the tweets was an account of Canadian complicity in the tragic voyage of the St. Louis. In 1939, the Canadian government also refused to admit the passengers of the St. Louis, contributing to their suffering, and to the demise of over two hundred men, women and children who perished at the hands of the Nazis in Europe. The fate of the St. Louis’ passengers, and Canadian involvement, is well documented in Harold Troper and Irving Abella’s None is Too Many: Canada and the Jews of Europe, 1933-1948 in which they recount the central role of race, and anti-Semitism in inhibiting humanitarian efforts on behalf of Jewish refugees. Literally embracing the idea of “none is too many”, the Liberal government of Mackenzie King rebuffed and avoided campaigns by concerned citizens to provide assistance to Jewish refugees. The story of the St. Louis represents a dark moment in Canadian history though not necessarily an exception to the larger history of exclusion that has characterized the country’s past and which continues to challenge notions of inclusivity and incorporation today. Parallels between the story of the St. Louis and the current moment in the United States are rife. Yet there is another lesson that the St. Louis can provide, which might energize those who believe that learning from the past is important and that change can be effected in part by seriously engaging with the impact of previous decisions and their very human repercussions. In the late 1970s, millions of people fled violent conflicts in Vietnam, Cambodia and Laos. Ironically, given current events, the United States was relatively swift to respond to the humanitarian plight of the so-called “boat people”, many of whom escaped in dangerous, unseaworthy, vessels. In resettling over one million people, the United States government was motivated in large part out of a desire to vindicate the devastating impacts of the Vietnam War and to rehabilitate the country’s reputation internationally. In Canada, the response was neither immediate nor swift though humanitarian efforts would gain momentum and the private sponsorship program would ultimately contribute to the resettlement of over 60,000 people. At first, however, the government of Canada responded slowly and cautiously. A key turning point in the Canadian government’s was the publication of None is Too Many. Sections of the book circulated among immigration officials as the situation in Indochina worsened. The authors detailed in dramatic terms the failure of the Canadian state to come to the aid of Jewish refugees fleeing Nazi persecution. The Minister of Manpower and Immigration, Ron Atkey, made the work required reading and Jack Manion, the Deputy Minister, informed officials that nothing akin to the voyage of the St. Louis was to occur on his watch. I heard about the impact of Abella and Troper’s book from former immigration officials responsible for screening and facilitating the movement of people out of Indochina. Four decades after their time on the ground, None is Too Many continued to animate their worldviews. As both a historian, and a concerned citizen of the world, I desperately wish that the story of the St. Louis, and the impact it had on fostering a sense of responsibility among Canadian immigration officials, could animate the worldviews of the current US administration, or that some other equally powerful call to a sense of common humanity could put an end to this dangerous and heartbreaking charade. One of the most powerful things about None is Too Many is that civil servants transformed words into actions, something that is required now more than ever. Editors Note: This post initially referred to the Trump administration as the “Drumpf” administration. This was an editor’s error and we sincerely apologize. For a helpful and current summary, see http://www.humanrightsfirst.org/resource/trumps-refugee-and-immigration-executive-order, accessed 6 February 2017. For an interesting discussion of this phenomenon, see The Refugee in International Society: Between Sovereigns. (Cambridge: Cambridge University Press, 2008).